Finding sufficient water for irrigation is one of the major challenges facing farmers in Asia and sub Saharan Africa. Very often it is too expensive for small farmers to buy, run and maintain engine driven or Electric powered irrigation pumps. Low cost Treadle pump, instead could make an important difference and could boost Agricultural produce and food security in the region significantly. 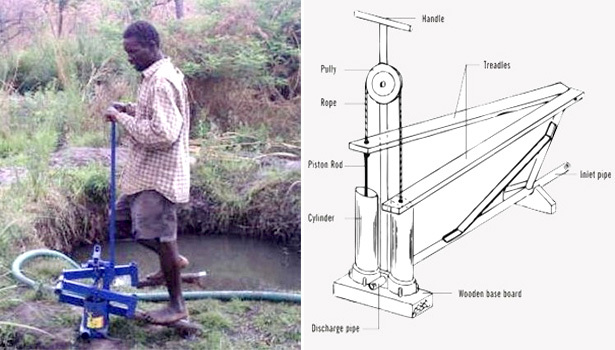 Treadle pump makes it easier for farmers to retrieve water for their fields or vegetable gardens. Low cost treadle pump can replace the age old practice of irrigating very small plot of land using bucket lifting technologies, which are slow, cumbersome and labour intensive. Treadle pumps are far more efficient and user friendly. The pump can be used in a comfortable way. The farmer stands on the treadles, pressing the pistons up and down by pedaling, there by lifting sufficient water for irrigating his land. The treadle pump assures access to water, freeing farmer from vagaries of nature, erratic power supplies and expensive diesel. The treadle pump is portable system, can be moved from one location to another location, nearest to the source of water (Bore holes, open well, ponds, canals etc.) The treadle pump has to be properly adjusted and maintained for efficient pumping of water up to 5000 Liters per hour without tiring, it has to be operated in a natural way as walking.